White House economic adviser Lawrence Summers said the compromise deal on taxes between the administration and congressional Republicans will help remove doubt about the U.S. economic recovery, which faces more challenges because of Europe’s financial turmoil. This is what happens when you put a D level economist in an A level position. Larry thinks that vague terms like ‘doubt’ and ‘uncertainty’ mean something in relation to economic growth in this environment; That they are the reason the economy isn’t growing. They do, just not right now. There’s another word that’s far more important, DEMAND. Since there’s not enough DEMAND in the economy, there’s not enough GROWTH in the economy. Larry says this deal will help grow the economy, which it will. By roughly .5% and it’s purely short term. The estimates of 1.3 million jobs created are even less credible than the Administration’s claims (which were driven by Summers) that ARRA was large enough to reignite job growth. I don’t care what Mark Zandi says, businesses are not going to hire just based off tax policy and there is no way this creates enough demand to generate employment growth, especially in light of the fact that we’re looking at massive layoffs in the public sector coming very soon. This is, in short, tax policy as stimulus and it’s targeted EXACTLY the wrong way. Summers raises the specter of financial crisis in Europe. It’s a high probability event and THE SINGLE LARGEST REASON WHY NEED TO CONCENTRATE ON STIMULATING DEMAND HERE. By spending money on infrastructure and physical plant, not by wasting it on still more tax cuts. Obama and Summers have both been focused on exports which is amusing since Europe may fall into a depression and the BRICs are, at some point, going to slow. Who, on earth, is going to buy everything we want to export? From where will the demand come? Why not stimulate DEMAND for our own products? That’s a question that neither Summers nor the President ever answer. Summers then talked about compromise without even understanding that this compromise does precious little to stimulate the economy and thus was worthless on balance. Summers apparently doesn’t realize that compromise to achieve a common goal is worthy but that, in this situation, we did not share a common goal with Republicans. The Republicans in Congress only want to hurt Democrats and the President. If they throw the country into depression in the process, then so be it. The President’s goal was merely what he thought would be a ‘grand compromise’. Note that neither Republicans nor the President were particularly concerned about economic growth or jobs. Because they honestly think everything will get better on it’s own. Summers is, in effect, a modern Andrew Mellon, except fatter. What else could we expect from the man who lectured CA Governor Gray Davis about regulatory changes during the CA energy crisis that was, in fact, being caused by Enron. Meanwhile, Congressional Democrats who were not consulted on this deal, are crying foul because it’s not stimulative enough and it’s further extends a regressive tax structure. I think they’re also rather peeved about the President lying with regard to the effect his deal will have on about 95% of this country (they’ll see almost no benefit). Let’s just take a moment and remember that economics are NOT ideological. This is about what works and what doesn’t. Anything that doesn’t create aggregate demand is worthless. 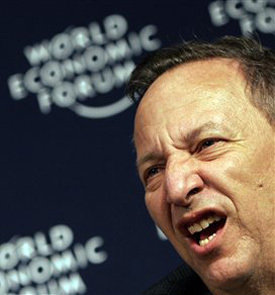 And this package, this ‘compromise’ is worthless but no more so than Larry Summers. Congressional Democrats would be wise to completely ignore Summers. In situations like this, you need to listen to smart people, not blustering morons with a penchant for lying. Is the title of this piece harsh? Sure. However, this country has gone through quite a bit of unnecessary pain over decades because of the inept Summers. He’s tried, in the past, to sideline himself and restrict his disastrous ideas to Harvard. However, he seems incapable of staying away from the big stage of DC where poorly educated and intellectually deficient politicians (economically speaking, of course) find him intoxicating. Therefore I can see no way to keep him from mucking things up than to hope, desperately, that he kills himself. Pills would be fine, driving a car off a cliff would be OK as well. Maybe shooting through the temple or back up through the mouth. Doesn’t really matter as long as he does the right thing. This entry was posted in Economy, Stupid Administration Tricks and tagged Democrats, Economy, Larry Summers, Obama, President, Republicans, stimulus, stupidity, Taxes. Bookmark the permalink.